WHY DO WE TURN TO THE RADIO? And how do they keep us connected? ESA member AH seems to be always able to dig up ‘something’ on a topic. When the ABC was mentioned he produced these gems from 1920s to 2010s. Until 1932, the ABC was a private company. In 1932 the C in ABC stood for Commission and the service we still know began. The station began transmission with an outside broadcast of a performance of ‘La Bohème’ featuring Dame Nellie Melba, from His Majesty’s Theatre. From 1928 the Postmaster-General’s Department (PMG) was responsible for the technical side of all Australian A Class stations including 3LO. The Australian Broadcasting Company was given a licence to provide all programming – an arrangement which remained until 1932 when the Australian Broadcasting Commission was formed. The two Melbourne stations (3LO & 3AR) had a studio in Melbourne Place, a laneway off Russell Street near Little Collins Street, until the building of Broadcast House in Lonsdale Street in 1945. 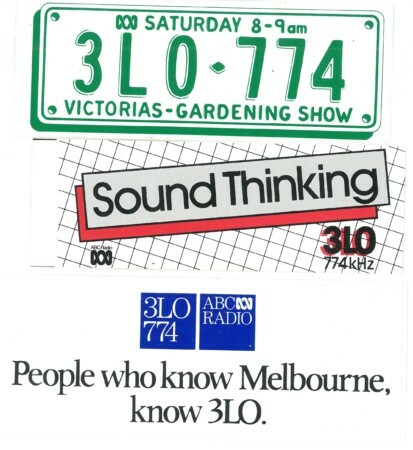 The 3LO on-air studio at Broadcast House was studio 308, although for many years the news broadcasts came from Marland House in Bourke Street. 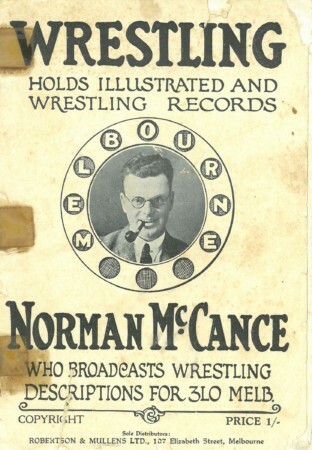 Wrestling guide, 1927, from ESA member AH. Young listeners were well catered for. 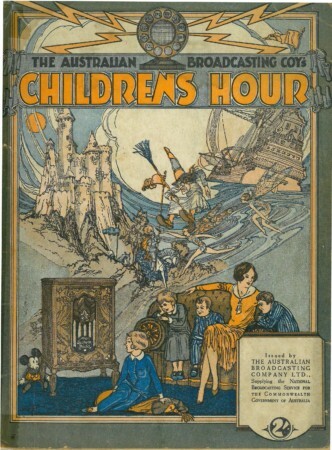 This programme for the Children’s Hour was published in 1927 – card cover, stapled, 64 pages and full of stories, fact and fiction, and with its private company background included advertisements for sweets, pens and Mickey Mouse. Another child oriented service was offered by ABC personality Miss Kookaburra whose sign off can be seen in the lower right hand corner. She sends birthday wishes. The children are using headphones, is the rabbit communicating with them via a microphone? The certificate dates from 1925-1934. Given the use of the same telephone dial logo as is on the magazine, it may be a pre 1932 version of the ABC. 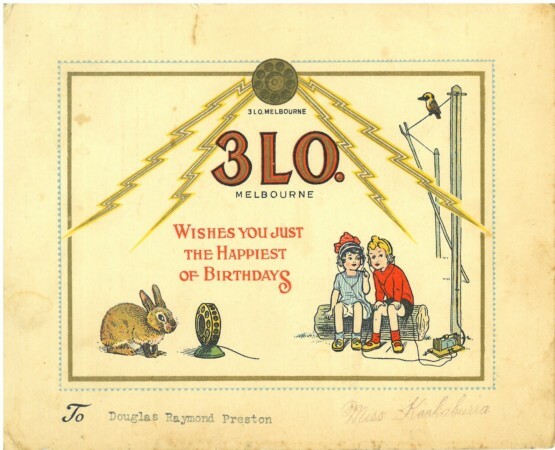 3LO Birthday club run by Miss Kookaburra who was in operation between 1925 and 1934. Collection of ESA member AH. 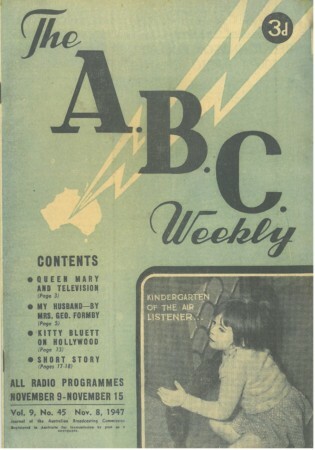 A more modest publication The ABC weekly began in 1939 and ran to 1954. This issue is on poor quality paper, stapled, has 32 pages. It was preceded and succeeded by other ABC magazines. This is directed to the whole family, in fact mainly adults, with a radio programme for the week, stories about personalities, fiction and advertising for a variety of products. The ABC weekly, 8 November, 1947. Collection of ESA member AH. 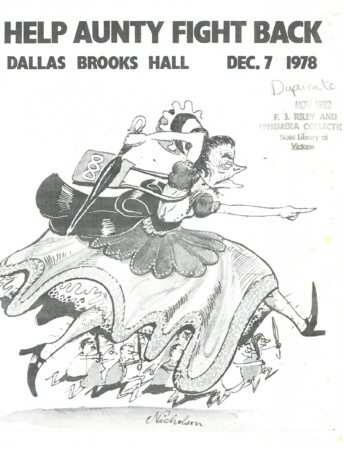 A small folded card, and probably free, guide for three months of drama broadcasts in 1971 on ‘Sunday playbill’, ‘National radio theatre’ and ‘Encore’. 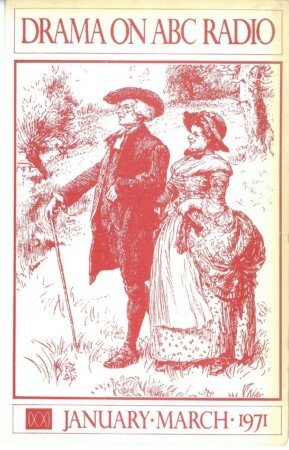 ‘Drama on ABC radio’ collection of ESA member AH. The new website features warnings, alerts and preparatory information relating to bushfires, floods and cyclones, and delivers emergency-related news coverage sourced from across the ABC as well as updates via Twitter and Facebook. “People are relying more and more on using mobile and online to learn about emergencies and disasters, seek help, and share information. Social media is becoming an integral part of emergency communications,” says Gabby Shaw from ABC Innovation. 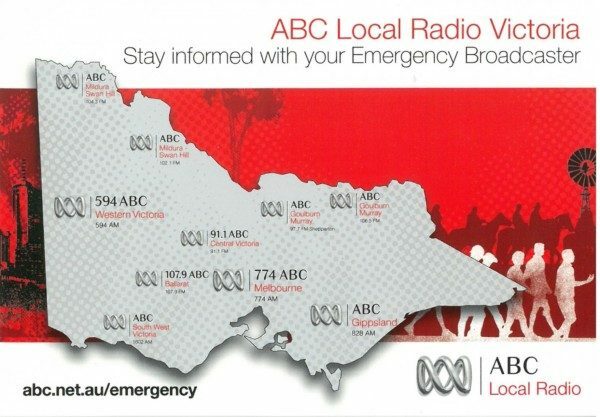 “These digital services can help improve people’s access to information such as warnings and alerts, and enable them to quickly view coverage relevant to their location.” (2012) http://about.abc.net.au/abc-history. Postcard with magnet for use on fridge with emergency station details, c. 2012, collection of ESA member AH. What did we do for the ABC? 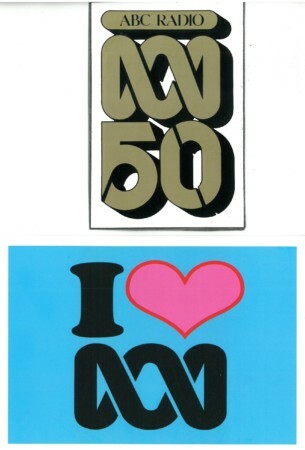 Stick on bumper and other stickers and attend meetings when listeners and viewers thought the ABC was under attack. The bumper stickers are probably from the 90s. Folded flyer for supporters’ meeting. AH’s collection includes some other more general items which have not been scanned including the old radio and TV licences. Wonderful treasure from the past. Thanks AH.